If you are looking for some fun elementary art lessons or projects to keep your kiddos busy and have a great time at the end of the year, here is a fun project idea. 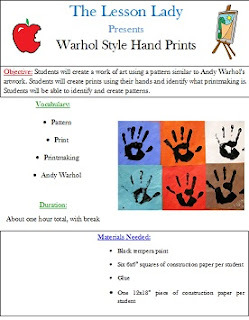 For a fun and free art project for the end of the year, check out this FREE Andy Warhol hand print lesson. Andy Warhol was a Pop Artist that is famous for his prints of popular and common objects. This lesson gives some examples of Warhol's work and helps your students create a memory with their hands that they can use to compare from year to year as they grow. I also think that it would be fun to do a hand print project at the beginning and end of each year to compare how their hands grew! Another idea is to do prints of other objects such as apples or oranges cut in half if you don't want to get their hands quite as messy! You can also alternate in different colors or objects to practice making patterns. What do you do for the end of the school year? Share it with us below!